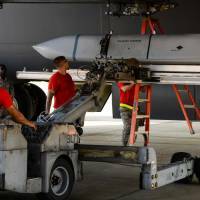 Japan was given a preview of the stealthy JASSM-ER “standoff” missiles it is considering purchasing after U.S. officials said B-1B bombers launched the weapons Friday for the first time in combat during strikes on the Syrian regime. The new Lockheed Martin Corp. air-launched cruise missile made its battlefield debut in the strikes when 19 of them were fired outside Syrian airspace by two B-1Bs that had targeted the Barzah Research and Development Center located on the outskirts of Damascus. The firing of the Joint Air to Surface Standoff Missiles (JASSMs) was first reported by The Drive, a military and aviation website. U.S. officials later confirmed the launches of the extended version of the weapon, which joined 57 Tomahawk missiles that Pentagon officials said targeted the site. Japanese Defense Minister Itsunori Onodera said in December that the ministry had sought to allocate funds to study the feasibility of arming Air Self-Defense Force F-15J fighters with the JASSM-ER, the extended version of the weapon, which is capable of striking North Korea. The long-range, radar-evading cruise missile has a range of about 1,000 km (620 miles) and is “designed to destroy hostile air defenses and high value, well defended, fixed and relocatable targets while keeping aircraft safely out of range from hostile air defense systems,” according to Lockheed Martin. Onodera did not mention North Korea or China in his December announcement, and stressed that Japan will leave strike capability to its defense ally, the United States, but some lawmakers have called for a more robust ability to deter and defend Japan and its interests. Having the missile in its arsenal, as well as the JSM (Joint Strike Missile) by Norway’s Kongsberg Defense & Aerospace, with a range of about 500 km, will make it theoretically possible for Japan to strike military bases or nuclear sites in North Korea and to defend its maritime interests near the contested Senkaku Islands in the East China Sea. China also claims the Japanese-administered isles, which it calls Diaoyu. Onodera said in December that the JSM will be mounted on Air Self-Defense Force F-35 stealth fighters. Japan, however, is still bound by its pacifist Constitution, which renounces the right to wage war, while its missile forces are currently limited to anti-aircraft and anti-ship munitions with maximum ranges of just 300 km. 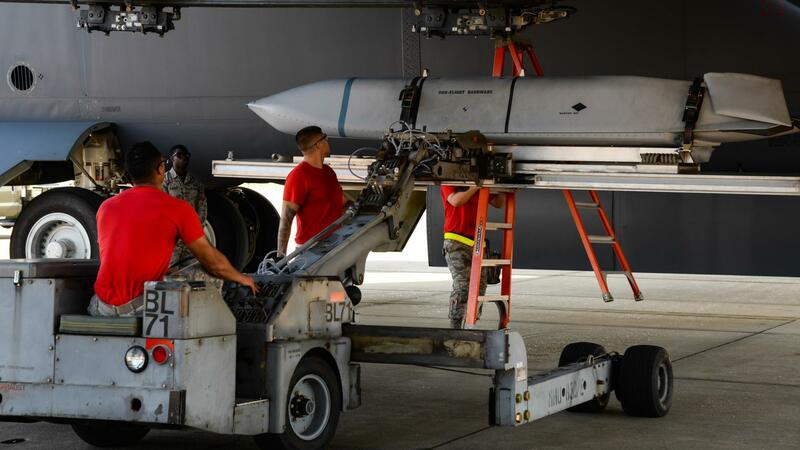 The JASSM-ER was approved for combat in the United States in February, but faced development problems early on, including several failed tests. But he said the demonstration may not play out quite this way in the Japanese context. “The Japanese government’s justification at this point in time for acquiring the JASSM-ER to be fitted to Japan’s F-15Js is for bolstering its ability to defend its maritime periphery,” Wallace said. Wallace said that given current limitations on Japanese missiles, ASDF pilots will increasingly be at a disadvantage and in greater danger in maritime air engagements, namely those with China, as the Asian rival develops its own air capabilities and standoff weapons. Wallace noted that while Tokyo’s current policy is not for Japan to use any of its capabilities to strike targets inside the territory of other nations, that could change in the future. Whether Japan should possess the ability to strike enemy bases is expected to become one of the major points of the debate on national security this year, when Japan’s National Defense Program Guidelines and Medium Term Defense Program are set to be revised. Media reports have said the ruling Liberal Democratic Party plans to propose this for debate in relation to revising the guidelines. It’s clear that when the standoff missiles are expected to be operational in 2023, Tokyo could “field capabilities allowing it to strike DPRK (North Korean) land targets in some kind of autonomous capacity if Japan were desperate and the U.S. was unwilling to defend Japan,” Wallace said.